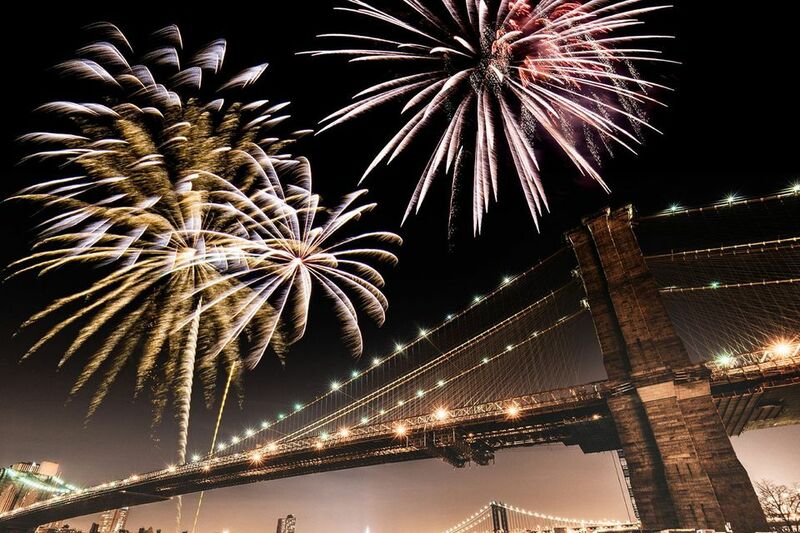 Nothing says 4th of July revelry like fireworks bursting overhead, and no destination does Independence Day pyrotechnics better than New York City. Macy's plays host to the nation's largest 4th of July fireworks display, illuminating the evening skies above the East River this year. Here's everything you need to know about making the most out of the 2018 celebration. The fireworks show is scheduled for Wednesday, July 4, 2018, at around 9:25 p.m. The spectacle will last for about 25 minutes. Come early to snag a good spot and to beat the thickening crowds at the official viewing points as the evening progresses. Note that the designated access points will be closed by the NYPD as viewing areas fill up, and spectators will be redirected accordingly. Be sure to give yourself extra time to work your way into and out of the crowds. Where Can I See the 4th of July Fireworks? The display extends along the East River, and will be visible from East River shoreline fronting Manhattan (especially along the Midtown-fronted sections of the FDR Drive and in the South Street Seaport district), Queens (Long Island City ranks tops), and Brooklyn (try Brooklyn Bridge Park). The fireworks will be fired from seven barges positioned on the river between 23rd and 42nd Streets in Midtown, and there will also be a larger barge parked just below the Brooklyn Bridge. For the best viewing of the Midtown barges from within Manhattan, head to the elevated sections of the FDR Drive. In Queens and Brooklyn, make way for any part of the riverfront with unobstructed views of the sky, with particularly good viewing in Long Island City and Greenpoint. To catch the displays from the double-barge positioned just below the Brooklyn Bridge, head to the shores of the East River in lower Manhattan, including the South Street Seaport district. The Brooklyn waterfront along the lower East River, especially in Brooklyn Bridge Park, also offers prime viewing. The event organizers advise to skip the following areas, where viewing won't be optimized: Battery Park and Battery Park City; Roosevelt Island; and, in Queens, Hunter’s Point South Park. If you want to see the fireworks, take the subway! The fireworks are, of course, the main attraction, but they'll be shot off and choreographed to an arrangement of patriotic tunes, which will feature performances from the West Point Band Orchestra and Glee Club. There will be performances by Kelley Clarkson, Blake Shelton, Keith Urban and Ricky Martin. NBC will broadcast the fireworks spectacular during a TV special (starting at 8 p.m. ET).